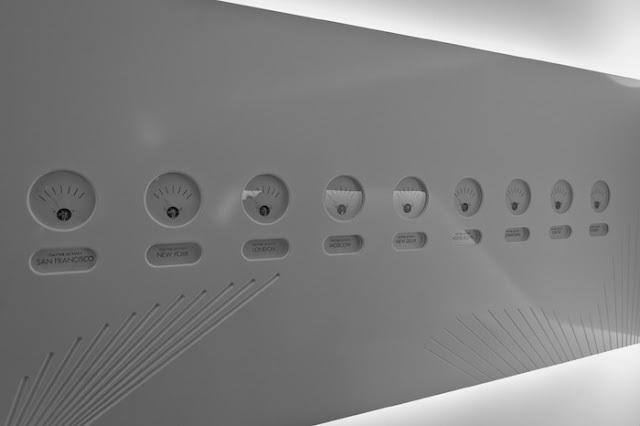 There are a number of newly emerging paths into Oblivion - most notably via the free version of Google SketchUp and Blender, we will be covering these over the coming weeks. This tutorial is aimed at exporting from SketchUp Pro to 3D Max and finally into Oblivion although any import method into 3D Max will work. 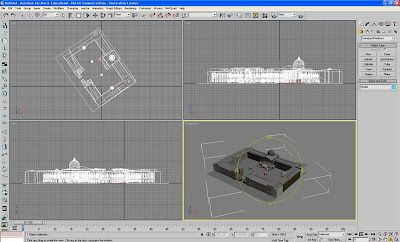 1) SketchUp Pro - A fully functional 8 hour version can be downloaded from here. 2) 3D Studio Max - A 30 Day fully functional trial can be downloaded here. 3) Nif Tools Exporter for 3DMax - Blender and Maya are also available from here. 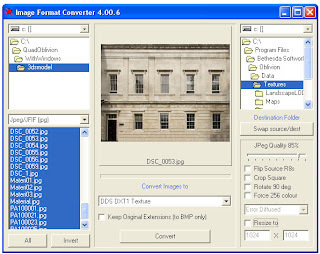 4) Convim - A image conversion package to convert files to the .dds format allowing you to import textures. Download via the Convim site. 5) A 3D Max script to change image settings - Part of the BlurScripts pack which can be downloaded here (zip file). Open or create your model in SketchUp and export to the .3DS format. 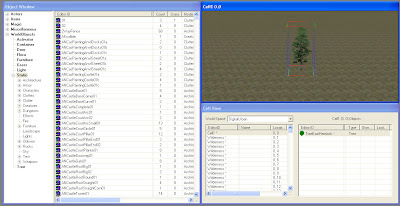 Ensure that the model is exported as a single object with generate cameras unticked. Download the Nif Tools Exporter for 3DMax and extract the two files - NifPlugins.dlu to the 3D Max Plugins directory and MaxNifTools.ini to the Max Plugcfg directory. Download the Blur Scripts file and extract the folder 'BlurScripts' into your Max Scripts directory. Make sure your model is grouped into a single mesh. If not group your object and then right click 'Convert to Editable Mesh'. 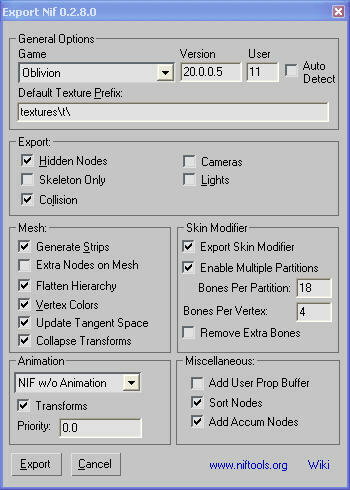 We need to find and replace all the texture file names within 3D Max to the .dds extension (the format that imports into Oblivion). Click 'MaxScript'/'RunScript' from the top tool bar. 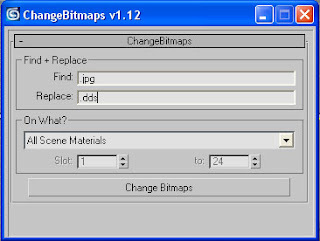 Navigate to the BlurScripts folder and select 'ChangeBitmaps'. In our case we want to change .jpg to .dds for the files we will create later using Convim. Type .jpg and .dds into the relevant dialogue boxes as pictured above and click 'Change Bitmaps'. Select the options as pictured and click 'Export'. You model is now saved in the .nif file format ready for import into Oblivion. Click 'Convert' - you now have the model and the textures in the correct format ready to import. Open the Elderscrolls Scrolls Construction Set and select 'File\Data'. 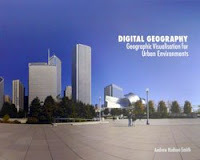 We will be using the files created in Part One of this tutorial - in our case we created DigitalUrban.esp. Firstly double click Oblivion.esm and DigitalUrban.esp (or your file name) a cross will appear next to the files. With your file name highlighted click 'Set as Active File' this ensures that your world loads correctly into the construction set. Click 'OK' and your world will load. All we now need to do is simply open our World Space and import a new object. 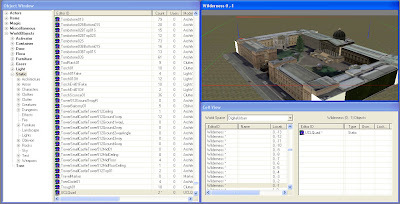 In Cell View scroll down until you find your worlds file name - Select it (again in our case Digital Urban) and double click in Cell1 where we will see the tree we placed in the first part of the tutorial. Double click the tree and then click the 'Lightbulb' icon in the top tool bar to ensure you can see it. In the Object Window - on the left - select 'Static' and right click on any object name in the list, Select 'New' and type in a ID into the option box, in our case UCLQuad. Click 'Add Nif File' and choose your model saved out of 3DMax. Click Ok. The model is now ready to be added to the scene. Launch Oblivion - you are now ready to view your world. Select 'Data Files' from the Oblivion start screen. A menu will appear allowing you to load your new world. 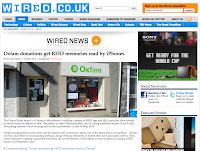 Select 'Oblivion.esm' and 'YourWorldName.esp' - ours is DigitalUrban.esp. Click 'OK' and Play' from the main menu. Press 'T' to allow you to advance in time - towards daylight, select 10 hours. Thanks for the comments.. to help we will upload the files from part 1 allowing you to load up with the flat starting land in place. This will get around any freezing on the height map. The scritps etc should all be ok but if let us know any problems we can help you through it..
Hello, it's great to see such clear instructions out. :) I've started to import models from 3DS Max 8 to Oblivion but I haven't succesfully made a collision mesh that isn't affected by the "collision bug" (something about custom collision models crashing the game). The nif exporter seems to keep crashing when i export a model. Do you know any way around that? Sorry to hear of your frustration - importing can be a tricky process if you get stuck. But when i try to imported to TES the game is over... I tried to import less complex model as u sad and it works...so the problem could be the complexity of my model..in your tutorial u used a very complex model and mine is less complicated but the geometry that's generated from import export i think is the real problem...any advice how to clean up 3ds model so it could be exported to TES with no problem? I have a problem in the step 6 of the part 2. -- In line: include "$scripts\Blurscripts\BSlib.ms"
I need this this archive right ? Where did you upload the files from part 1? how do I make it so I cannot walk through my models. I want my objects to be solid so that I can walk on them, and not through them. E.g. If i make a modern looking house exterior that I want to use in the game, i dont want to be able to walk through my house. great tutorial and I have reached the emd but my model is purple. At first i thought it was the .tga file so i converted to .dds. any idea what I could be missing?